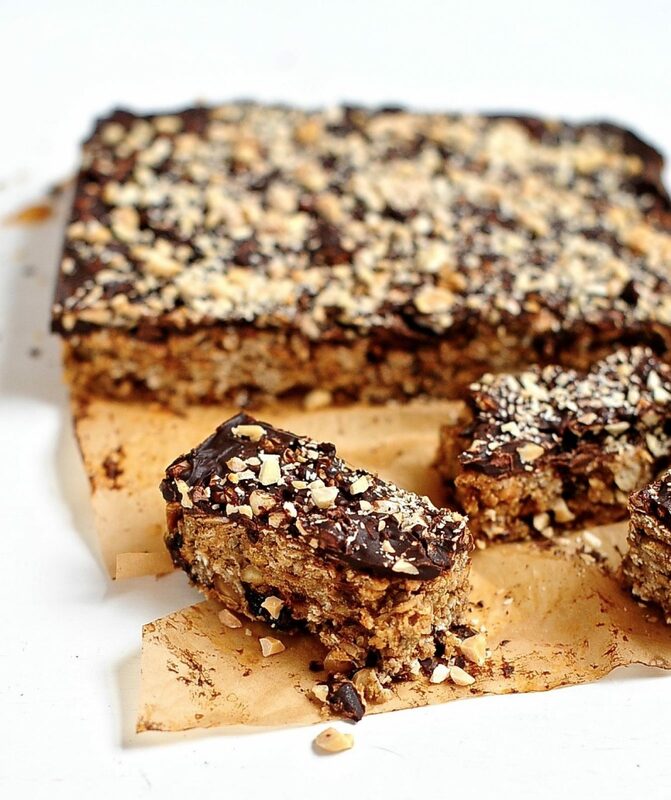 Butterfinger Breakfast Bars: Indulgent peanut buttery oatmeal bars with a sweet layer of chocolate and a sprinkling of chopped roasted peanuts are both healthy and delicious! I recently discovered that breakfast bars were a thing. Whoa, world expanded! My routine falters when warm days arrive and a steamy bowl of oatmeal no longer appeals no matter how much fruit I pile on top. Enter the breakfast bar. 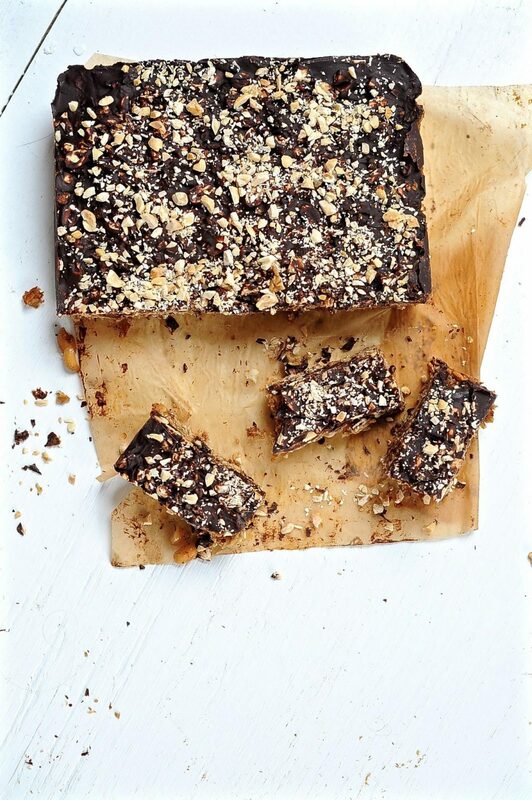 Go ahead breakfast bar take a bow. 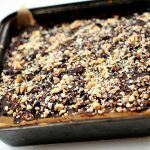 I have begun whipping up batches of these moist, chocolatey, fruity, peanut butter bars and they have been disappearing as fast as I can pump them out. This morning we woke up in our hotel room in NYC and what did my husband pull out of his bag? You guessed, it a plastic container filled breakfast bars. Delicious, convenient, healthy, filling, what more could you ask for? 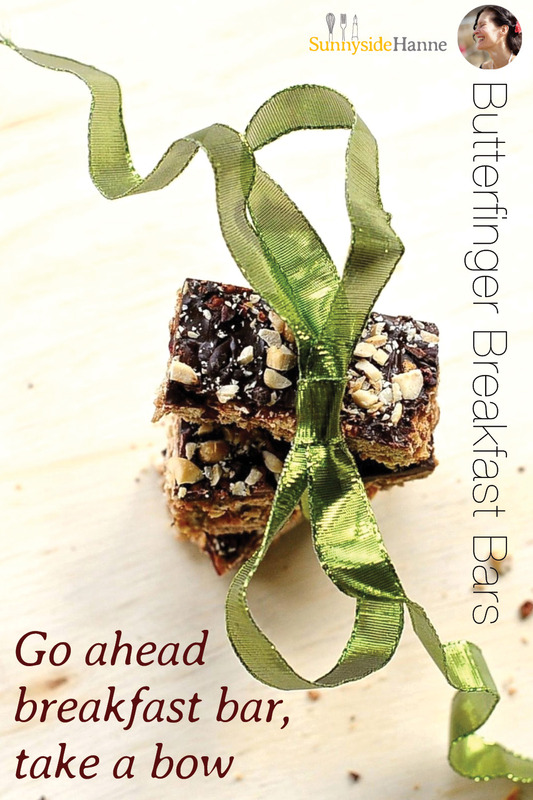 Close your eyes and bite into one of my copycat Butterfinger breakfast bars. Will you swear you are biting into the real thing? No of course not. Open your eyes, in your hand is a bar made from oats, natural peanut butter, dark chocolate and other healthy ingredients. There is no way on earth that it tastes like an honest to goodness Butterfinger bar. The actual factory made bar has 18 ingredients, including corn syrup, hydrogenated palm kern oil, tertiary butylhydroquinone, and monoglycerides. 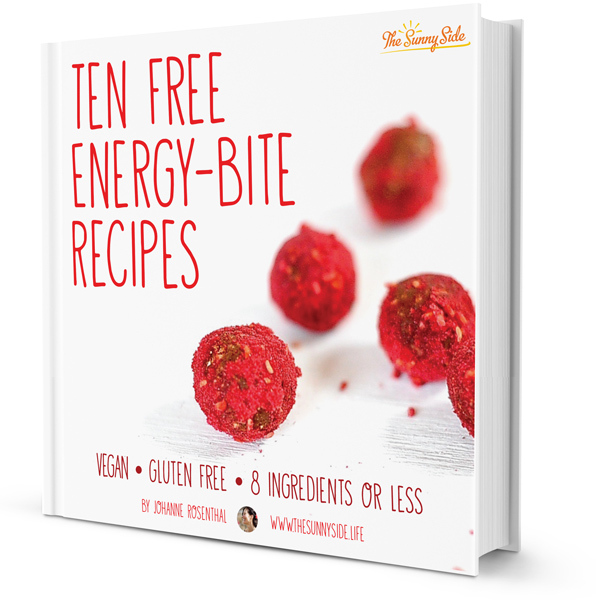 This recipe has 11 ingredients, 7 of them whole foods and all of them pronounceable. Never eat anything you can’t pronounce. Except quinoa, quinoa is okay. I used to passionately adore Butterfingers. They were my go-to candy bar and the 1st bite always made me moan in pleasure. One dark and stormy Halloween as the kids and I trundled from house to house trick-or-treating my son, knowing of my past addiction, handed me a Butterfinger bar. It had been years since I tasted one. I thought what the hell let me return to childhood as I wander my old neighborhood filled with the aching joy of nostalgia. I tore open the yellow wrapping in the glow of a street lamp and took a nibble. There is was, yes baby, crispity, crunchity, peanut buttery smothered in a layer of milk chocolate. I closed my eyes waiting for a moan of pleasure to escape my lips. Nothing but the rising taste of chemicals flowering on my palate. Never spoil dessert with dinner. 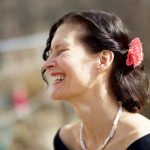 So I swallowed and bringing the bar close breathed in the heady aroma of store bought candy. I bit into the yielding chocolate bar. The classic Butterfinger flavors were even more fleeting and the crescendo of chemical stew hit faster and stronger. Paradise lost, until I realized years later that I could meld the tastes of my childhood with my adult palate. 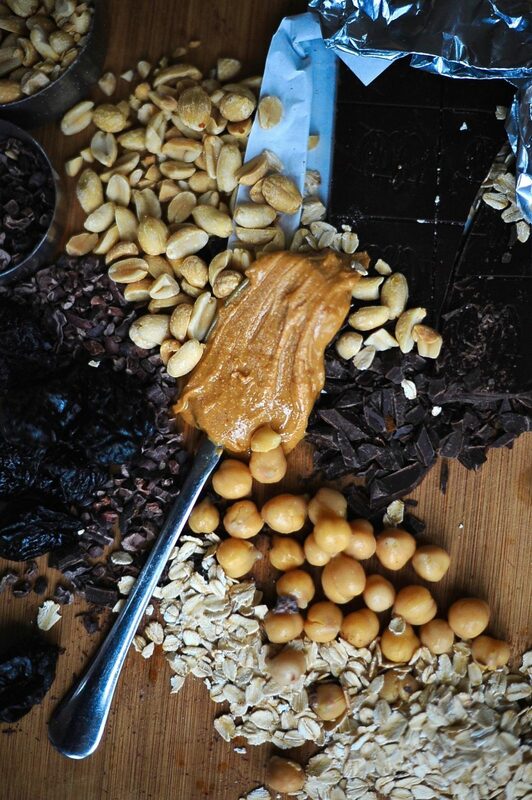 I remember what it was I loved about those bars: Creamy peanut butter which I replaced with…um…peanut-butter. 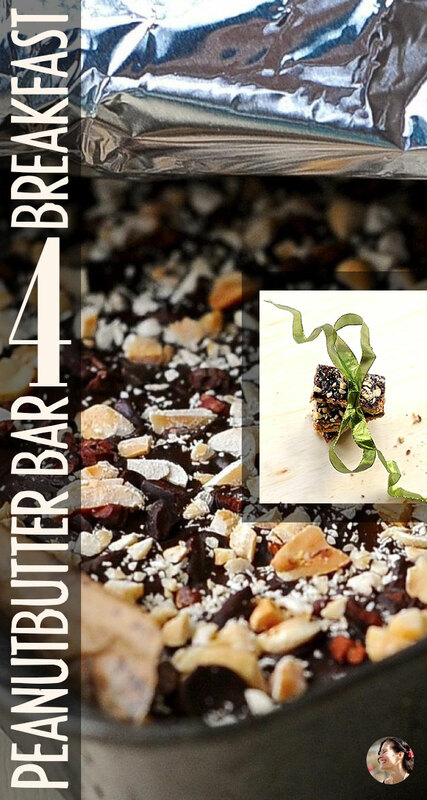 The crunch of corn syrup candy, which I replaced with cacao nibs and chopped roasted peanuts. Prunes soaked in cherry juice add the background notes of caramel found in the original. The final touch for me is always the chocolate, the original uses milk chocolate but I am a girl who prefers my chocolate dark and bitter like my heart. When I was a child I was sure adulthood meant being able to eat dessert for breakfast and now I can. Little known fact: the inspiration for Paradise Lost came from the time that Milton bit into a Hershey bar and realized that they taste more like wax than chocolate. 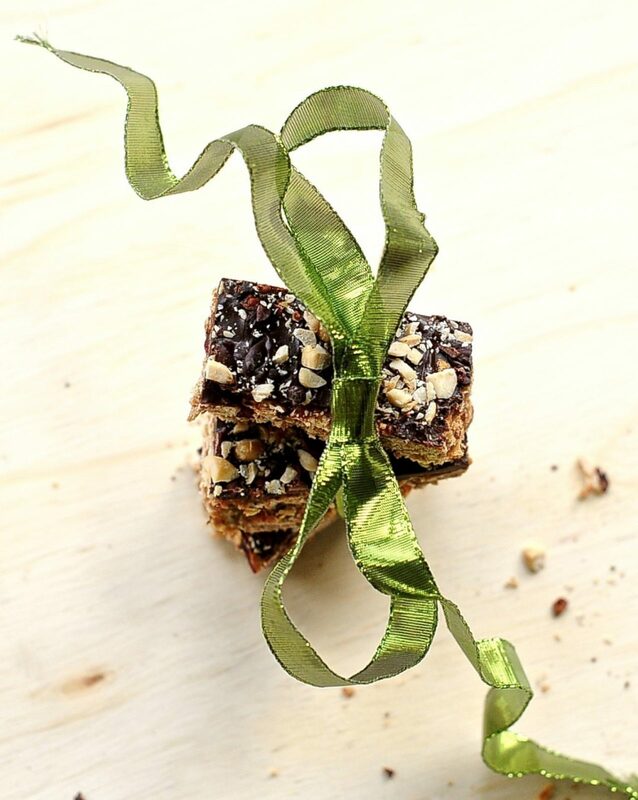 One bowl breakfast bars that hit all the notes of salty, sweet, crunchy, moist and chocolatey. 30 minutes from now you could be eating one instead of drooling over photos. What are you waiting for? Thinly slice and soak your prunes in enough juice to cover. Allow them to soak for but 15 minutes. You can skip soaking your prunes if you want and you will still have a moist and delicious bar. Feel free to substitute raisins or any dried fruit. Heat your oven to 350 Fahrenheit . In one large bowl place oats, 1/4 cup peanut butter, banana, chickpeas, maple syrup, vanilla extract, drained prunes, and aquafaba. At this point I drink the liquid that I drained off from the prunes, so yummy. Take off your jewelry and start massaging the mixture, really getting in there and mashing those chickpeas. When you have a cohesive mass set the bowl aside. Line an 8"X 8" metal pan with parchment. I use a strip that is as wide as the pan and a few inches longer so that I am only really lining 2 sides and the bottom. It makes it easier to lift the baked breakfast whole when it is done baking. Scoop 1/2 your batter into the pan and smooth the top. Take that extra 1/4 cup peanut butter and dab it over the surface of your batter. Now place the rest of the batter over the peanut butter layer and smooth the top. Pop it in the oven and bake for 20 minutes. Sprinkle the chocolate over the top of the bars and bake another 2 minutes until the chocolate is gooey. Remove from the oven and smear the chocolate in a smooth layer with an offset spatula. 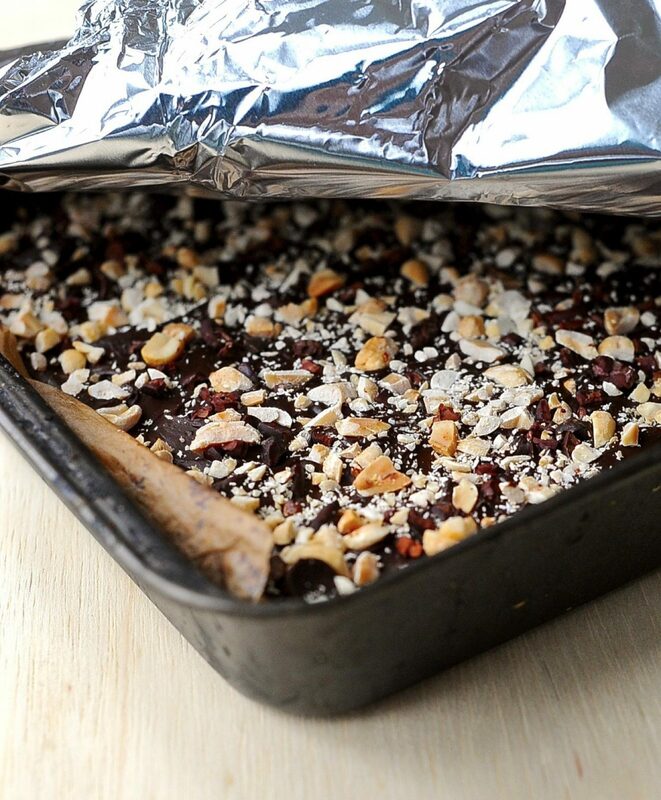 Sprinkle on the cacao nibs and chopped peanuts and return to the oven for 3 minutes. Remove from the oven and allow to cook on a rack. I usually gently press the peanuts and cacao nibs into the chocolate at this point incase some have not adhered. LOL! Your quotes for this post made me giggle. Also, the last time I indulged in a Snickers bar it was with much disappointment… all I could taste was salt. Ugh. Yay, I made you giggle. I also remember that day when cartoons suddenly seemed “fake”. That was a bummer, but I began to love them again when my kids were little. oh these look so awesomely good! I had a similar experience with a Mounds bar – YUCK. I have a question though is there something I can substitute for the acquafaba? Thank you! Good question. I would replace it with 1/4 cup apple sauce and 1/4 cup water if I were to try it at home. But that is a guess. Please let me know how it goes. Use it with my blessing. Lol. My go-to was 3 Musketeers. I don’t know if they make that candy bar anymore (it’s not available in the country I live in now and probably never was). If I ever come across one in the US I won’t buy it. I know it would taste disgusting. I’m happy to let it remain in my childhood where it belongs. You and I would gather together all the small change we could lay our hands on in the apartment, walk around the block to the Sunnybrook Farms convenience store, slip into the store hoping that the cashier wouldn’t notice our bare feet and pile our careful selection of junk food – as much as we could buy with our bag of pennies, nickels and dimes – on the counter. Those were the days. 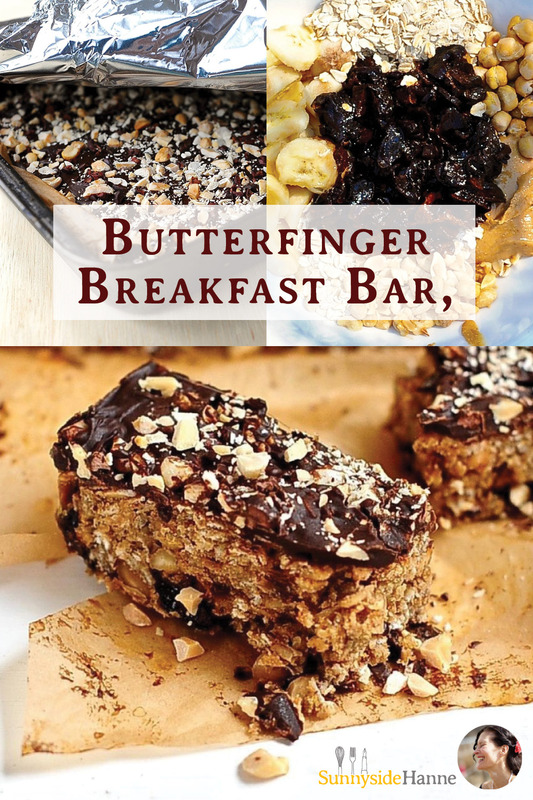 These butterfinger breakfast bars look amazing. I second that (e)motion! Pease do mint Milanos! Keep an eye look out for tomorrow’s post.